A leave on broad spectrum antimycotic treatment against dermatophytes, fungus and yeasts. Effective against a range of Gram + bacteria. 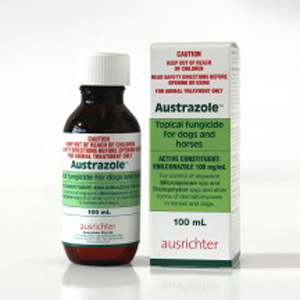 Austrazole contains a broad-spectrum clincally-proven topical antimycotic for the treatment of fungal and yeast infections on horses. Ringworm is highly contagious and must be treated if a horse is to be presented for racing or competition. Austrazole is an apply and let dry treatment. No rinsing. Butorphanol tartrate is a synthetic opioid agonist – antagonist analgesic and sedative. At higher doses it is analgesic and at a lower dose it has a predictable sedative effect. Ear management for dogs with recurring ear issues. Recommended for clinic administration by veterinarian, technical or nursing staff. Eliminates potential for cross infection of ears. No antibiotic, antifungal or corticosteroids – reduces antibiotic use. DL Methionine Injection acts to detoxify the liver. DL Methionine protects tissue from free-radical damage. As a lipotropic agent, it plays a fundamental role in healthy liver function. It has antioxidant activity, protects the liver and lympathatic system and other tissues throughout the body against free-radical damage. Equisedan is a dose controlled equine sedative and analgesic for all indications including visceral pain. Manufactured to European Union [EU] Good Manufacturing Practice [GMP]. A guarantee of product quality and reliability. Restorative properties, particularly after illness or injury. Promotes health in pregnant mares. A Lysine Paste designed for palatibility for cats and kittens suffering from the symptoms of Feline Herpes Virus FHV-1. Lysine cannot be synthsised by cats and must be given as an nutritional supplement. Cats and kittens lick the paste off their paws or it can be added to food. Lysine Paste can be used either during episodes or for daily management of symptoms. Do-it-yourself treatment. Liniment for treatment of sprains, strains and rheumatism in horses and dogs. For the treatment of abscess formation, inflamed tendons and joints, and to ripen pustules. 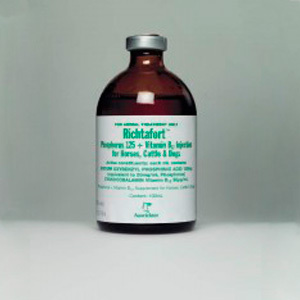 Richtafort 12.5% + Vitamin B12 Injection is the highest potency phosphorus injection on the market with 125mg of phosphorus per mL compared to its competitors of 100mg of phosphorus per mL. To increase resistance to infectious diseases, parasitic infestations, promotes growth and wellbeing. A sedative, analgesic and muscle relaxant for horses and deer. Approved for intravenous IV and intramuscular IM injection. 50 mL multi dose vial. Proven and effective treatment of neomycin or sulfonamide sensitve bacterial enteritis in calves, horses, dogs, and cats. Broad spectrum antibacterial injection – gram positive and negative infections. Long-acting – once-a-day dosage – sulfadimidine + trimethoprim.